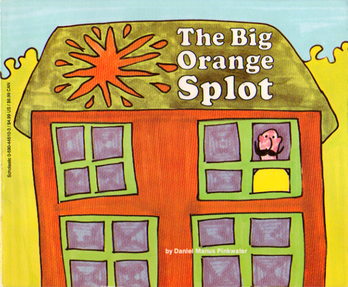 There is a children’s book by Daniel Pinkwater called The Big Orange Splot. Though the author may not have intended it particularly in this way, this is a book about education reform. 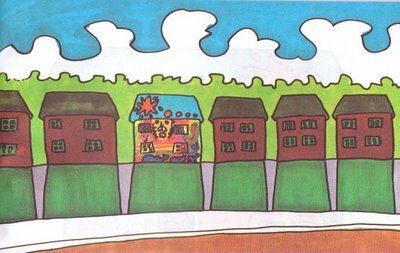 A man named Mr. Plumbean lives on a “neat street” where all of the houses are identical. One day, a seagull drops a can of orange paint on the roof of his house (“nobody knows why”). His neighbors pressure him to repaint his roof to get the splot off and make his house look “neat” again. Instead, he goes out, gets many colors of paint, and supplements the big orange splot with “little orange splots, stripes, elephants, lions, pretty girls, and steam-shovels.” Out front, he adds a variety of flora and fauna, a hammock, and a pitcher of lemonade. His neighbors call him crazy. One neighbor turns his house into a boat, another turns his house into a hot air balloon. The original book ends here, but let’s explore Mr. Plumbean’s world a little further, remembering, of course, that each person’s education is really embodied by each “house” in this story. Not on Mr. Plumbean’s “neat street” from the book, but maybe on the other side of the neighborhood, there are some houses in disrepair: peeling paint, broken windows, mold in the ceilings, cracks in the walls, broken appliances. Over the first few years when these houses were being constructed, the builders weren’t very skilled at creating new houses. In fact, some didn’t even realize they were supposed to be building a house at all! The construction was pretty haphazard. A worker was called in to fix some of the interior walls. She worked very hard for several weeks. However, each time she fixed a wall, a few days later it would need to be repaired again. Apparently, there was water leaking from above. Acknowledging the futility of fixing walls that would just keep getting damaged, the worker moved on to other houses. The leak had really been coming from the roof. A roofer had indeed been asked to fix the roof. However, he couldn’t send his team out to fix it until he was sure that the walls underneath were structurally strong enough to support the added weight of his team. The roofers continued to fix other roofs instead. Wall fixers gave up since the roof wasn’t fixed yet. Roofers gave up because the walls weren’t sturdy enough to go out on the roof to fix it. This cycle (and several other issues) continued for many years. Eventually, many people from both the neat part of the neighborhood AND the not-so-neat part of the neighborhood agreed, correctly, that having children living in houses that were in such condition was simply not OK.
Public pressure led the city council (who didn’t happen to be builders or architects, themselves) to implement some new building codes. If a house didn’t meet the code, the people living in the house plus the workers who built and fixed the house would all receive stiff penalties. The penalties may even be severe enough to put the workers out of business. The city building inspectors would come around at the end of each year to make sure all structures were up-to-code. Since the penalties for residents and for workers were so severe if they did not pass this inspection, the neighborhood association decided to send representatives around to all of the houses once every two weeks to make sure the residents and workers were on-track to being up to code by the end of the year. They did, indeed, want the buildings up-to-code for everyone’s benefit—but they also wanted to make sure there weren’t lots of homes that fail the inspection in their neighborhood…..then people would want to move to different neighborhoods. Many of the workers were very excited about the extra attention and support their work was now receiving! 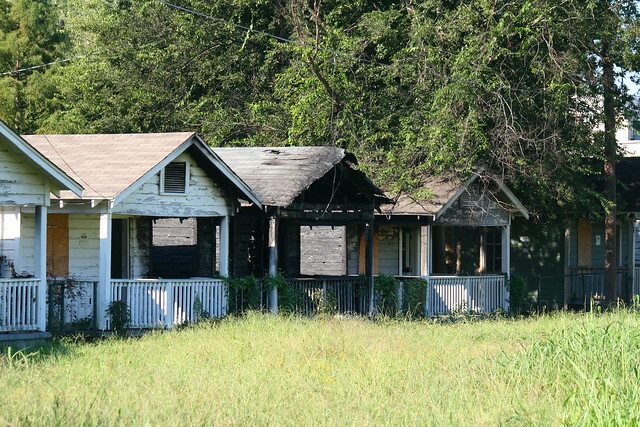 After all, they didn’t want the hard work they were doing on all of these houses to keep falling into disrepair! The building codes required that all roofs and walls get fixed—houses can’t exist without these things, after all, and these essential parts of the house’s structure were in disrepair in many homes. There were strict requirements about the types of materials the walls and roofs could be made out of and how they must be assembled. To make room for these new thicker, sturdier walls and roofs (and for the constant stream of workers who will be constructing, testing, and fixing these walls), all of the residents’ family pictures and artwork were taken off the walls and all of the bookcases (and the books they contain) and other furniture were removed from the house so they didn’t get in the way (or get sawdust or paint on them). The residents decide to sell the computer, TV, some of the toys, and their guitar so they have the resources to pay for all of the improvements to their house (Plus, they don’t have time to use any of these things anymore, anyway, since they were devoting all of their time to organizing all of the workers who were coming in and out of the house all the time). Over time, some more of the houses do indeed pass their yearly inspections. (Hooray!) Some even go above and beyond the walls/roofs requirements and get their windows fixed, which isn’t even part of the official inspection. The residents (as well as the neighborhood association and the city) are proud to live in an area where more homes pass the inspection! The workers are proud of their hard work! For the houses that fail inspections, the contractors that worked on these houses are given precise new guidance about how to do their jobs more effectively, so that houses they work on don’t fail the inspection. Some are indeed able to get more of their houses to pass the inspection in the next round. However, some of these workers start to get frustrated, particularly the craftsmen who had previously enjoyed working closely with residents to design specialized floor plans, built-in bookcases, backyard playsets, etc. as well as many interior designers who previously oversaw all this work. The get fed up at being repeatedly told what to do by the city inspectors and they are frustrated in particular that they have to JUST work on the walls and the roof instead of working on all of the other components that really make a house a home. Many of these talented people leave and take jobs in other cities without as strict a focus on the inspections, or they take on new careers altogether. In addition to providing more specific requirements for the contractors, the neighborhood association schedules even-more-frequent check-ins for the houses that failed the inspection in order to monitor progress towards passing the next round of inspections. In order to schedule all of these check-ins and prepare for each of them, the residents don’t have any time to do anything but just work in their house with the contractors who are working on the walls and the roof. They don’t have time to go outside; they don’t have time to talk with their neighbors; they don’t have time to relax. Particularly after a few failed inspections, some residents get pretty frustrated with this process and start to think that their houses will never pass, no matter what. Many of these residents stop working as hard to support the contractors that keep coming in to work. A few particularly frustrated residents even make such a scene sabotaging their own walls and roofs that more contractors have to spend more time on their house repairing the damage instead of working on their neighbors’ houses. People notice this problem. They send in some new workers who are particularly passionate about getting the residents out of this situation, fixing their houses once and for all and transforming the neighborhood into one full of solid houses that will never fall back into disrepair. Some of these people get hired to be contractors and others even volunteer their own time to help out with this effort! These new workers and volunteers are indeed able to help some of the houses pass their next inspection. Among these houses, some even keep passing their inspections a few years down the line!! However, there are still LOTS of houses that aren’t passing their inspections and even the houses that did pass were still without many of the things that really make a house livable: family pictures and artwork on the walls, a computer, a TV, bookshelves/books, toys, etc. Luckily, a young resident of the neighborhood (maybe one of these people) took a walk one day and happened to come across Mr. Plumbean’s street. She saw one neighbor’s house that had been turned into a hot air balloon and another neighbor’s house that had been turned into a castle. She got a couple of her neighbors together and they talked to a few local architects, artists, engineers, and contractors (some of the good ones that were still left). These people jumped at the opportunity to help her out. Together, they worked to reconstruct the girl’s house and the neighbors’ houses. They built the houses to look like the dreams of each resident. One house was built to look and function like a giant computer. One resident created a new company and built the headquarters in her front yard. Another resident constructed a theatre in her basement and let spoken word poets and stand-up comedians perform every night. Another resident’s home became a medical lab (this house was right next to the giant computer house, so the resident of that house could crunch some of the data generated in the lab). Another neighbor’s house included a comfy coffee shop area where she organized daily discussion about interesting topics and held weekly dialogue groups with neighbors, residents of other parts of the city, and people from around the world, via Skype. All of these houses had solid walls and roofs. Over time more of the neighbors were inspired by these houses. Through their own excitement, and through the excitement they were able to generate among the contractors who were working on the houses as well as the excitement of a wide variety of other people in the community, more and more houses were recreated in this style. One afternoon, the girl walked back over to Mr. Plumbean’s street and knocked on his door. Thanks to Rachel Mattingly and Dave Cutler for their input on an earlier draft of this essay. This entry was posted in Education, TFA and tagged allegory, Big Orange Splot, corporate reform, Daniel Pinkwater, dream, education reform, high stakes testing, Mr. Plumbean, standardized testing, testing, TFA, The Future Project. Bookmark the permalink.